Newsner » WOW » 11 of the best photos of the 2017 Great American Eclipse! Monday August 21, 2017 saw millions of people unite in North America as well as other parts in what was a staring contest of some kind — but they weren’t staring at each other. They were staring at the sky trying to get a glimpse of the solar eclipse, of course. The name refers to the eclipse being visible across the entire United States, something that hadn’t taken place since June 8, 1918! If you missed it with your own eyes, then not to worry! 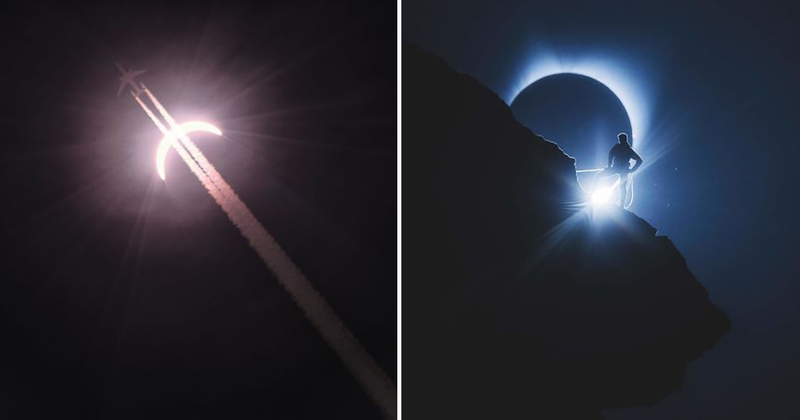 Here is a list of the 11 best photographs of the 2017 Solar Eclipse, one of mother nature’s most remarakable wonders. Enjoy! 2. ‘To the ends of the earth.’ Talk about no filter! 9. The first glimpses of the eclipse, from an airplane, captured by National Geographic photographer Babak Tafreshi. Wow! Absolutely breathtaking and unworldly — makes you really wonder how this kind of beauty is even possible? Did you also see the solar eclipse on August 21? Please tell us. Please share these incredible photographs of the ‘Great American Eclipse’ of 2017 with all your friends!